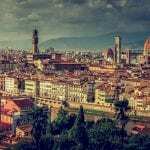 Are you looking for the best hostels in Florence? 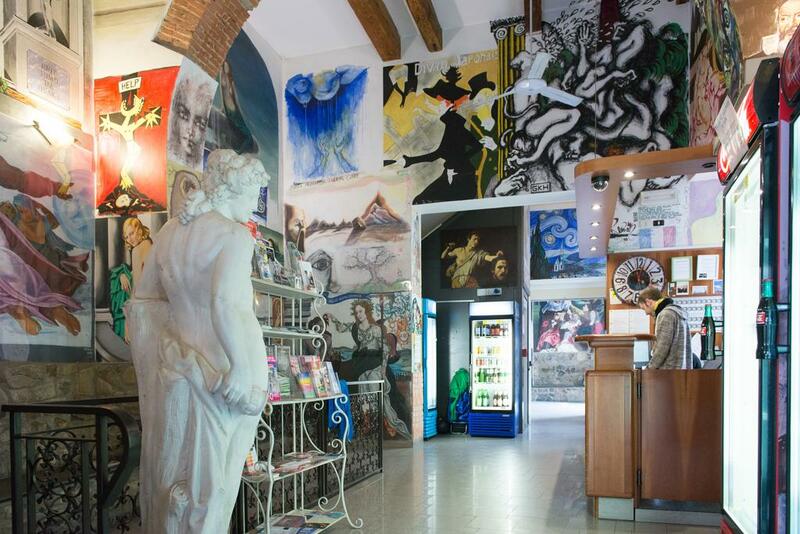 While the city has a lot of them not every Florence hostel is created equal. As the birthplace of the Renaissance, and one of the most beautiful cities in Italy (and the world) Florence should definitely be on your bucket list. 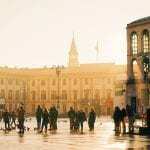 Brimming with history, art and culture, there’s never a dull moment in this busy city of soft pink, orange and red hues. Home to Giotto’s magnificent frescoes, Michelangelo’s famous David statue, and where Botticelli dreamt up so many of his incredible paintings, it’s no wonder Florence is known as one of the great art cities of the world. With so much history and culture waiting to be discovered and delved into, there’s no reason not to go to Florence. The list of things to see and do in Florence is endless. To be honest, you could go for a week and spend the entire time slowly meandering through art galleries and still feel like you hadn’t seen all the art there is to see. Florence is home to some of Europe’s best galleries, housing some of the rarest and most captivating collections. The Uffizi gallery and the Accademia are must sees. Then there are the countless churches, palaces and basilicas. 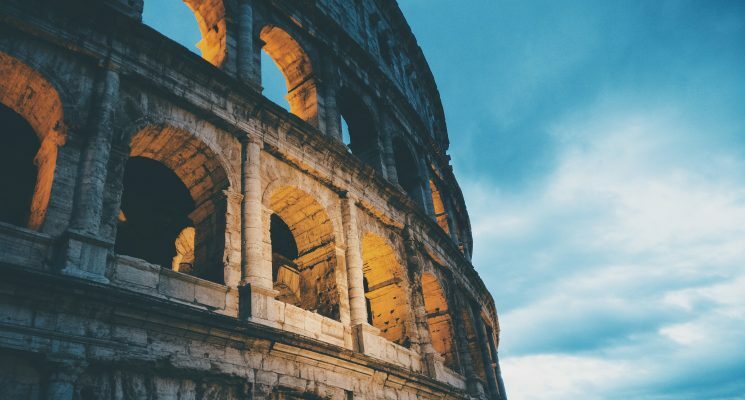 Lose yourself in a maze of cobbled streets, visit the romantic Ponte Vecchio and, of course, stuff yourself full of the best pizza, pasta and gelato while you have the chance. Immerse yourself in la dolce vita. Although it’s most famous for its artistic past, nowadays, Florence is a vibrant and youthful city. There’s a lively nightlife scene, a thriving contemporary art world, and a myriad of quirky boutique shops which bring Florence to the forefront of modernity. 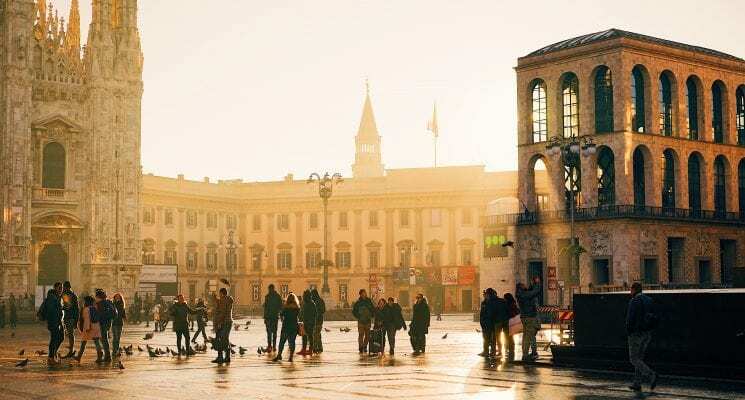 The streets are strewn with gourmet restaurants serving up some of the finest Tuscan cuisine, and bars where you can treat yourself to an aperitivo when the sun goes down. For more on this great city check out our article on things to do in Florence. Being a hugely popular tourist destination, it can be difficult to find affordable accommodation in Florence, especially during high season. We’re here to help you narrow down your options by selecting the best of the best hostels in Florence. 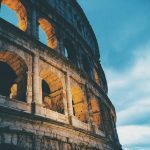 We have put together this list based on what we personally expect out of a great hostel in Florence. Clean rooms, comfortable dorm beds with power outlets, secure luggage storage, friendly atmosphere that encourages interaction (but doesn’t force it), and a communal kitchen are all super important aspects for all Florence hostels in our eyes, and we prioritize them when suggesting a place to stay. All of these are factors when it comes to making our selection of the best hostels in Florence, Italy. Located in the city centre of Florence, just 10 minutes from the main train station, PLUS Florence hostel is a great choice for travelers seeking comfort, convenience and a social atmosphere. Here are some of the reasons why PLUS is one of the best budget hostels in Florence. 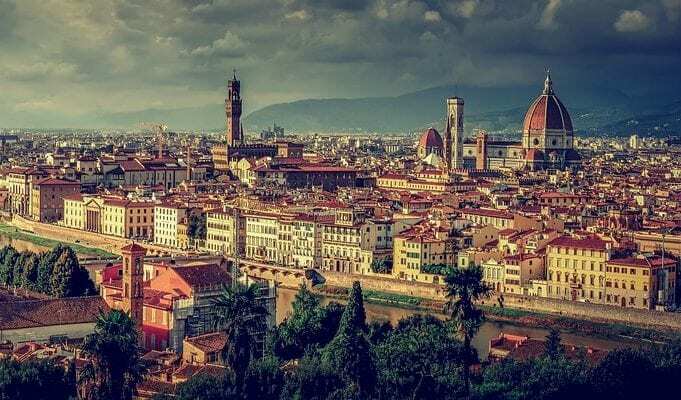 PLUS Florence Hostel is excellently located, and within walking distance to some of Florence’s top attractions including Ponte Vecchio and the Uffizi Gallery. Rooms are simple and elegant, providing you with everything you need for a good night’s rest at this Florence hostel. Mixed and female only dorms are available, sleeping up to 8 people, as well as private rooms. Each room has an en-suite bathroom, and you’re provided with a bed-light, charging facilities, secure lockers and a cosy fleece blanket in case the nights are chilly. There are plenty of communal spaces for socializing and meeting fellow travelers in this Florence hostel. Chill out on the rooftop terrace and take in the breathtaking panoramic views over Florence. There’s an outdoor pool that’s open during the summer, and an indoor one that’s open during the winter. There’s a fitness centre, as well as Turkish baths, and a sauna. Can you believe this is a hostel? Onsite you’ll find a cafe, bar, and restaurant providing delicious pizzas and even more delicious Italian wine! Cheap drinks are available during happy hour, and keep an eye out for the party events organized by the hostel. Although there isn’t a full communal kitchen, the guest area has a microwave and fridge where you can store your own food. A buffet English breakfast is available for a small fee until 11am. PLUS has a tour desk, and the friendly staff are always willing to provide you with tips and tricks to make your visit to Florence as hassle-free and memorable as possible. Comfortable, clean, and modern, this Florence hostel ticks all the boxes. If you enjoy a social atmosphere, and appreciate simplicity and affordability, then PLUS is right up your street and definitely earns its place on our list of the best hostels in Florence. For more information, reviews, or to book the best prices at PLUS Florence click here. Hostel Gallo D’Oro is a comfortable and affordable accommodation option located in the centre of Florence. Gallo D’Oro provides guests with all the essentials of a great hostel, and its amazing location in the centre of Florence is one of the main reasons why it claims a spot on our list of the best budget hostels in Florence. Spacious, bright, bright and airy, the dorm rooms at Florence hostel are nothing short of comfortable. Each room is individually decorated in a simplistic and modern way. Every guest is provided with a reading light, bedside table and a secure locker to keep valuables safe. One of the best things about this hostel is that it offers guests free breakfast! It’s not your generic hostel breakfast either. Prepare yourself for the day ahead and indulge in the homemade cakes, freshly baked croissants, sandwiches, fruits, coffee, freshly squeezed orange juice… we’re hungry just thinking about it. This Florence hostel is in the perfect location for exploring and discovering the city on foot. In just five minutes you can reach the the Accademia Gallery, where you can marvel at Michelangelo’s famous David statue. 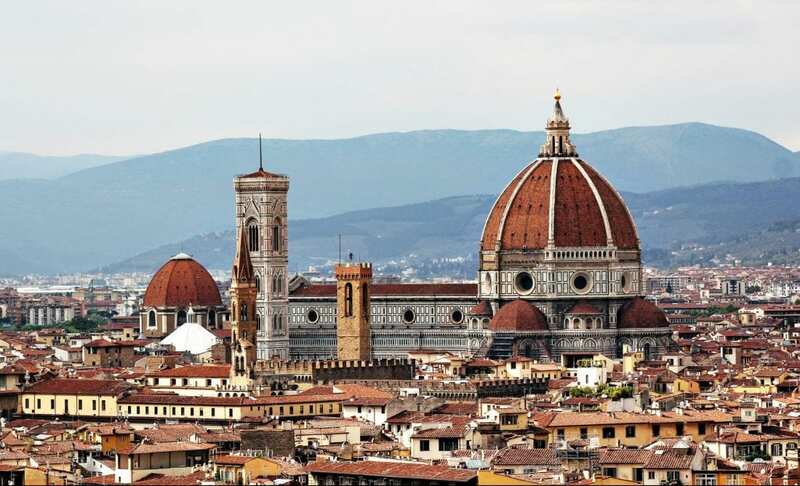 In 10 minutes you can reach many of Florence’s other attractions like the Duomo, the Uffizi and Ponte Vecchio. The smiling staff at reception are always happy to provide city maps, tour information and suggest the cheapest and best restaurants around, so you can eat like a local! All of that adds up to make this one of the best hostels in Florence, for realz! For more information, reviews, or to book the best prices at Hostel Gallo D’Oro click here. Hostel Archi Rossi is in the historic centre of Florence and provides guests with everything that a great hostel should. Described as “boutique style” this hostel has a cosy atmosphere and modern facilities. Just 250 meters from Florence’s main train station, the hostel is in a great location for exploring the city and its amazing landmarks. From Archi Rossi you can reach all of Florence’s must-sees on foot. Dorm rooms are bright, spacious and airy in this Florence hostel. The decor in the rooms is simple and modern, which contrasts to the eclectic mix of murals that cover the walls in the reception area. Guests are provided with a reading light, storage lockers and free linen. Always a great selling point for a hostel is the free breakfast. Archi Rossi does it well, providing guests with a breakfast buffet of fruits, pastries, juices and coffee (of course, this is Italy after all!). The restaurant offers cheap and delicious dinners too. The staff organize morning walking tours which have proved to be extremely popular. Learn about Florence’s captivating past while making friends with other guests of the hostel. Archi Rossi has a great social atmosphere where travelers can meet and swap stories. After a long day of sightseeing, guests can relax in the garden area or on the sun terrace with a cold drink of this exceptional Florence hostel. There’s also a wellness centre offering massage, a sauna, a spa and even a manicure service! Unbeatable location, friendly staff and great facilities are just some of the reasons why Hostel Archi Rossi is one of the best hostels in Florence. For more information, reviews, or to book the best prices at Archi Rossi Hostel click here. 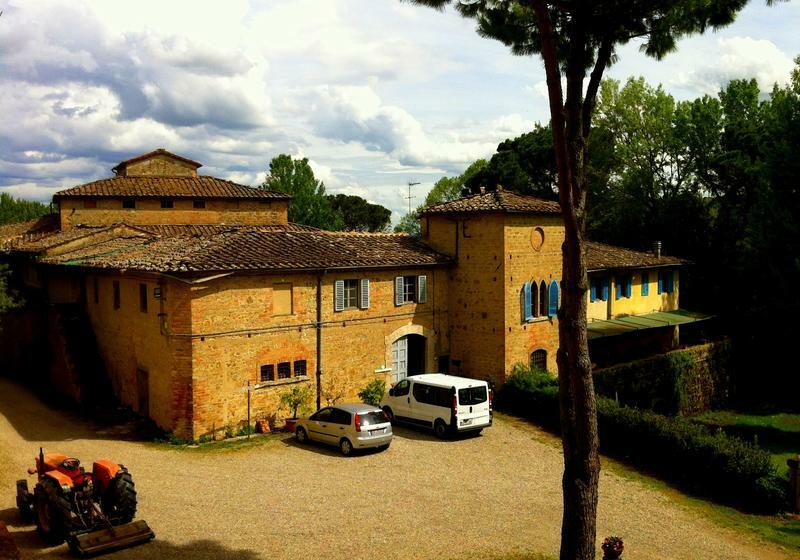 Okay, so it’s technically not in the city of Florence itself, but the stunning Bassetto Guesthouse in the Tuscan countryside was too good to emit from our compilation of the best hostels in Florence. Nestled among rolling hills, olive groves and quaint medieval villages, Bassetto guesthouse is the ideal getaway if you’re seeking a taste of the true Italian lifestyle. The perfect escape from the chaos of city life, you’ll find everything you need to give your traveling souls a chance to recuperate and breath the fresh air of this incredible region. Located in Certaldo, in the middle of Tuscany, the town has daily connections to Florence, as well as Siena, Pisa and San Gimignano which all take about an hour to reach by train. The helpful staff offer daily pick ups and drop offs from Certaldo station. Certaldo is worth a visit itself. Its cobbled streets and medieval architecture embody the spirit of small town life in Italy. Interestingly, this cute little town is the birthplace of Boccaccio, the writer of the famous medieval novel the Decameron. The building itself was a former convent of Benedictine monks which opened its doors to weary pilgrims looking for a place to rest. Nowadays, it operates as a farm producing local oil and wine. The guesthouse offers private rooms as well as dorms which are cosy and clean, providing everything you need for a good night sleep. Bassetto has the feel of a traditional countryside home. Soak up the warm Tuscan sun and recharge your batteries by spending the afternoon gently swinging in a hammock with a good book in hand. Take a dip in the pool to cool off, and then enjoy the traditional Italian gastronomy in the wine cellar restaurant. There are bikes you can rent to explore the surrounding areas easily, and the owners run daily tours from the guesthouse. Always wanted to learn to cook like an Italian grandmother? Bassetto offers traditional cooking classes so you can learn to make those mouth-watering pasta dishes from scratch! Wine tours, garden yoga classes, and city tours organized by the owners – there’s plenty going on at Bassetto. So if you want a taste of the real Tuscany then Bassetto guesthouse is the perfect place for you, and one of the best hostels in Florence. For more information, reviews, or to book the best prices at Bassetto Guesthouse click here. Less than 100 meters from Florence Cathedral, and within walking distance to many of Florence’s top rated attractions, Academy Hostel is a great choice for those who value location when choosing where to sleep. Academy Hostel is affordable, modern, and definitely one of the best budget hostels in Florence. Academy offers dorm rooms and private rooms. The dorms are spacious and bright, so you don’t have to worry about being stuck in a cramped room with smelly strangers! 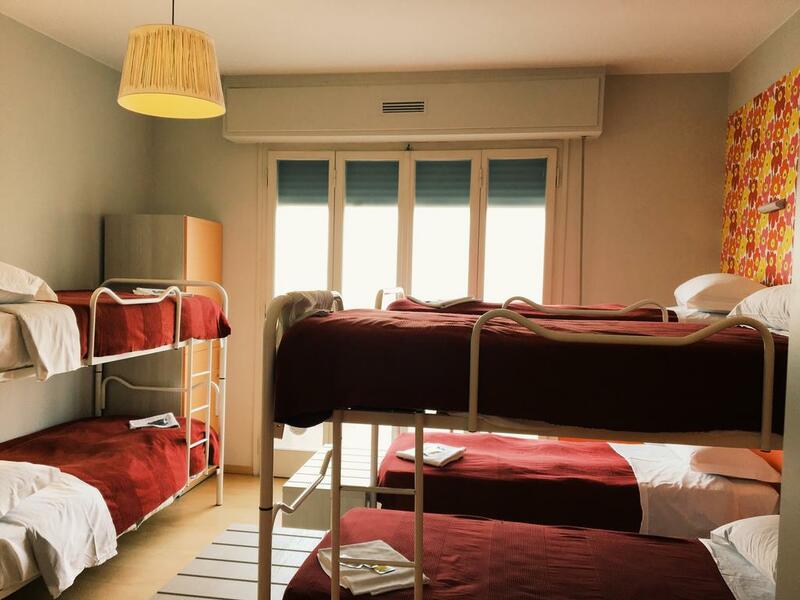 There are no bunk beds in this Florence hostel, and so there won’t be any loud noises as your roommates try to navigate their way into bed when the lights are out. Guests are provided with a locker, reading lamp and towels. Rooms are air-conditioned during the sticky summers and heated throughout the chilly winters. 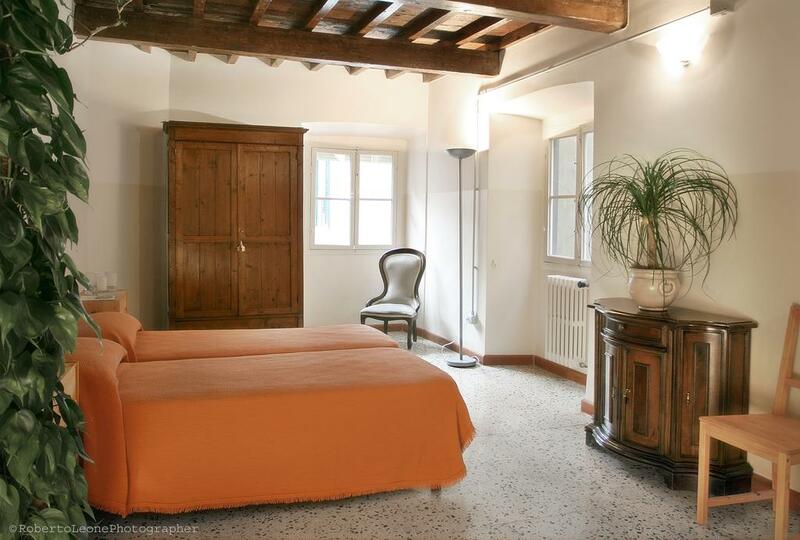 Its fantastic location in the center of Florence doesn’t compromise its comfort and cleanliness. 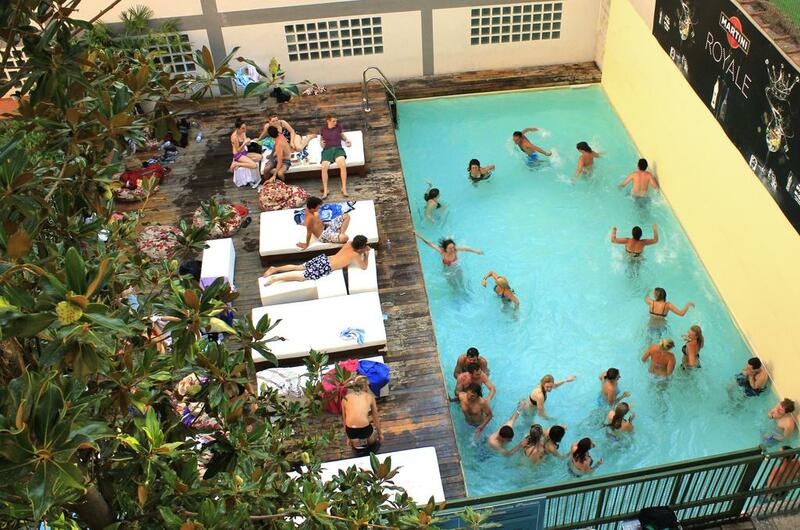 The hostel is extremely quiet, and is a great choice for the relaxed kind of traveler. This isn’t a party hostel, so if that’s the kind of accommodation you’re seeking, we suggest you try somewhere else. This Florence hostel prides itself on being a “home away from home” for travelers, and aims to create a calm and relaxed atmosphere where guests can chill after a long day, or enjoy quiet conversation in the common areas with fellow travelers. For those seeking a more lively atmosphere, there are plenty of bars, restaurants and clubs within walking distance. The staff at Academy are local Florentines, and are always happy to recommend the best restaurants and bars in the area. Its chilled-out vibe and convenient location make Academy Hostel a great option for travelers seeking budget accommodation in Florence. For more information, reviews, or to book the best prices at Academy Hostel click here. And there you have it folks, our picks for the best hostels in Florence. Hopefully we were able to help you pick the perfect place for you to stay out of all the options. As always, happy travels, and we’ll see you on the road!